← How to add filename as stamp on PDF document? Sometime we need to edit PDF and then print it directly.Say when you need to change date or signature in PDF file meanwhile, you also need to email it to some clients and print it. It sounds like a complicated job. However, if you have software VeryPDF PDF Editor installed, all those jobs can be settled in a few seconds. 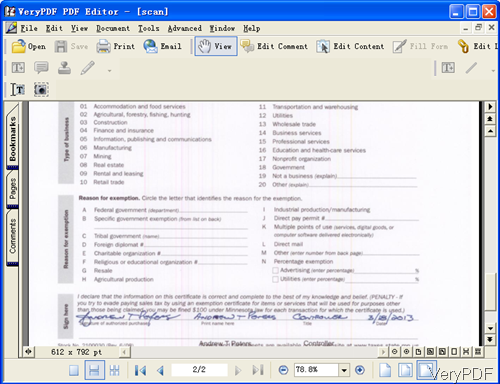 This software allows you to edit PDF file first and then email it, print it. The following part, I will show you how to make it. Download PDF Editor and install it . This software has software interface, so you need to install it by double clicking the exe file and follow the installation message. This process will take a few seconds. Once the installation finishes, there will be an icon on the desktop. Simply click the icon then you can launch it. Step 2. Edit PDF and Email it. The following snapshot is from the software interface. Please click option Open to browser the PDF file needed editing. Here I take an scan PDF file for example, my aim is to change the amount of the totally payment caused by printing mistake. Then I need to email it to the account department and print one copy to my boss for checking. Edit the payment first. Please click button Edit Comment then T button will go black. Please click it and then the mouse will turn to cross. Left-click the mouse the draw an area where it can be covered by the area you have drew. Then right click the area till the red box showing up. Then right click the area there will be an dropdown menu list. Please go to Properties. This step can be illustrated by the following snapshot. 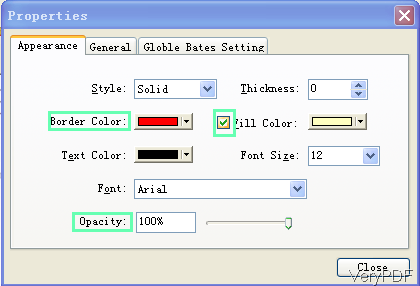 In the Properties menu, please make sure do the following settings: set the border color as white, set the fill color as white and make the opacity as 100%. When you finish setting button, please click button Close then you can back to the main interface. In the draw area, you can input the correct payment value by double click it. Once finish the inputting, you will find there is a new layer covered on the source text. By this method, the source payment value will be covered by the new value. Then it is not hard to find the Email button, please set up profile with outlook in advance. Then click Email button, the edited PDF will be sent according to the email address. Click button Print, if your computer is connected with the printer, there will be printing dialogue box showing up. Here you can choose the printing copies, printer, printing page range and others. And by click it, all the printers will be listed here including virtual printers. If you have virtual printers installed, you can convert it to other files formats. 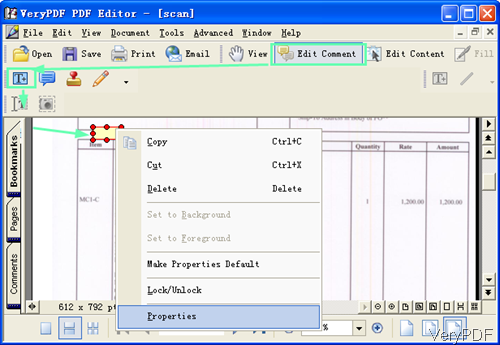 By this method, you can do the editing PDF, email PDF and printing PDF together. During the using, if you have any question, please contact us as soon as possible. How to edit PDF free online? This entry was posted in PDF Editor and tagged edit pdf. Bookmark the permalink.